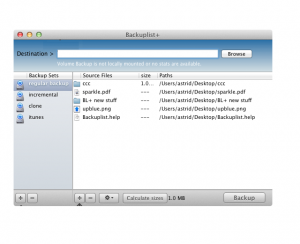 BackupList+ is an backup software for Mac widely used by people who want a easiest way of protecting all data without the extremely complex and difficult software. Free and best screensavers available for Mac. Contains: CircleText, Cyclone, Energy.saver, Euphoria, Firefiles, Flocks, Flux, Lattice, matrixgl, Plasma, SavaHollywood, SlideSaver, SolarWinds, Swirl, and Xeverywhere. 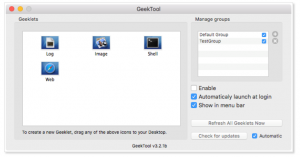 GeekTool is a Mac application that lets you customize your desktop and shows system logs, command line commands and output, or images with beautiful flexibility. There are many modules available that you can use for different source of information.